PROGEN has published a new application note for the validation of keratin antibodies using our high-resolution PEPperMAP® Epitope Mapping. The antigen sequences of 5 different relevant keratins (8, 10, 14, 18, and 19) were translated into 15 amino acid peptides at single amino acid resolution, i.e. with a maximum peptide-peptide overlap of 14 amino acids. 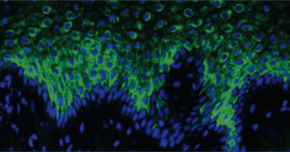 Incubation of these keratin peptide microarrays with PROGEN’s monoclonal mouse keratin antibodies highlighted the immunoreactions of the target antibodies and the epitope specificity. Based on this first pilot study, PROGEN plans to implement the independent validation by peptide mapping for the majority of its antibodies – antibody validation taken seriously! Read PROGEN’s application note to see how they used our PEPperMAP® Epitope Mapping service to identify the epitopes and possible cross-reactions of their keratin antibodies for western blots.